Power Management ICs (PMIC) of Ricoh Electronic Devices Company are developed using our three core technologies. Ricoh Electronic Device Company(REDC) develops Power Management ICs(PMIC) using our unique process technology, circuit design technology and advanced packaging technology. 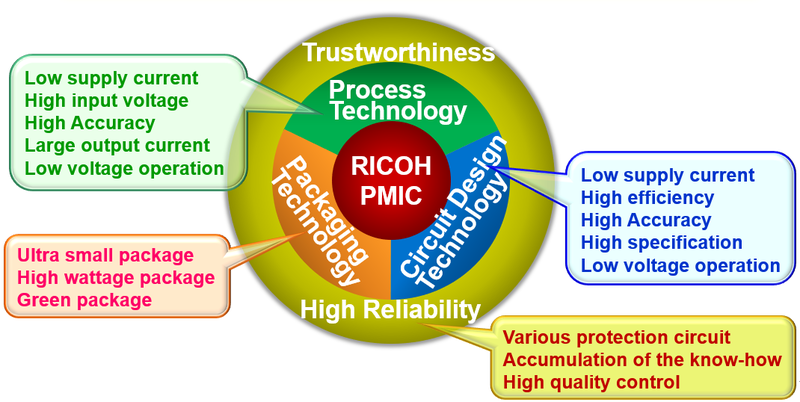 ・PMICs of Ricoh Electronic Devices Company have three quality grades for consumer, industrial and automotive applications. · For details of quality grade please check the REDC website.